Wild Ales, the perfect holiday pairing. There is nothing that excites us more around the Libertine than the holiday season. From the cooler (it never really gets cold here) days, snuggled by a fire. Or the time spent, around the dinner table, laughing with family and friends. To the beautiful offshore winds and big northwest swells that wrap into our little nook on the Coast. We love the holiday season for a myriad of reasons, but one of the best? The food. All the delicious food! Turkey, honey glazed ham, mashed potatoes, cookies, pie, green bean casserole, I’m getting hungry just thinking about it. And you know what pairs best with all those things? Beer. 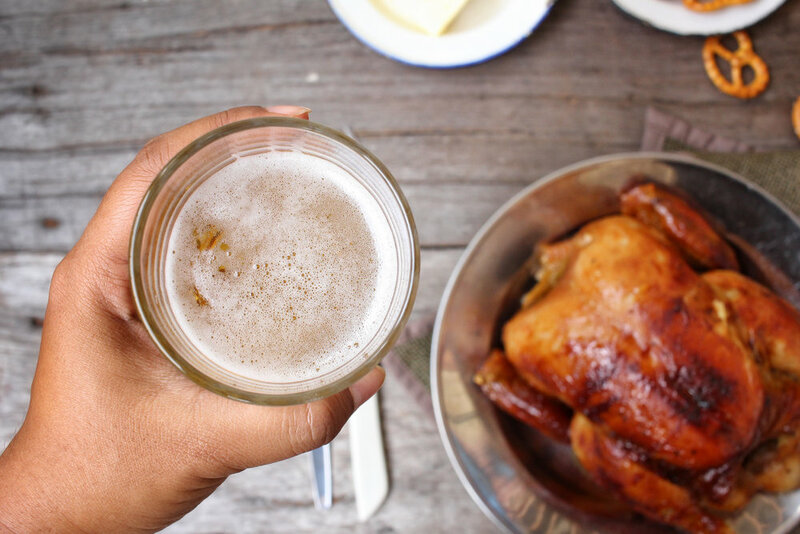 Just like wine, there is a beer to pair with every holiday dish. Beer has such a range in flavors that I think it wins in food pairing hands down. When discussing pairings, the obvious duo, is combining big bold stouts with the heavier foods, pairing power with power. But my favorite pairing with big heavy foods is, drum roll please…….. Wild Ales! ( AKA sour beers). I know, I know. BIG surprise. The wild ale brewery says to pair food with their wild ales. But just hold on a minute. Picture yourself, taking a big bite of a rich honey ham and following it with a side of mash potatoes and gravy. Do you want to chase it with a thick rich chocolate stout? Sure, it will stand up to it and won’t be lost in the boldness of the food. But what about a dry tart beer washing away all that heaviness. Rinsing your tongue with acidity and resetting your pallet for another big rich bite of gravy and ham. This works with chocolaty deserts as well. For instance, a piece of rich chocolate cake, alongside a tart beer would resemble that of a raspberry reduction drizzled across. Maybe choose a Flanders red or even better, a Kriek or Framboise. I don’t know about you but I am starting to get really hungry…and a little thirsty as well! So as I leave you salivating over the thought of delicious food and amazing beer. Remember, the holidays are for overindulging! Eat that extra piece of turkey. Grab an extra cookie on the way out the door. Crack another cold….wait maybe not everything should be overindulged. Drink responsibly, oh and don’t argue with your Uncle Jeff over Trump tweets. It’s the holidays and we could all use a break from the world and a reminder of what truly matters-loved ones, and beer, lots of delicious beer.